My week has been full of interviews. One in-person interview, phone interview, and a mock interview for a class I am taking. Needless to say, if I don't know how to carry myself or perform well in an interview than I probably shouldn't even be writing this blog. 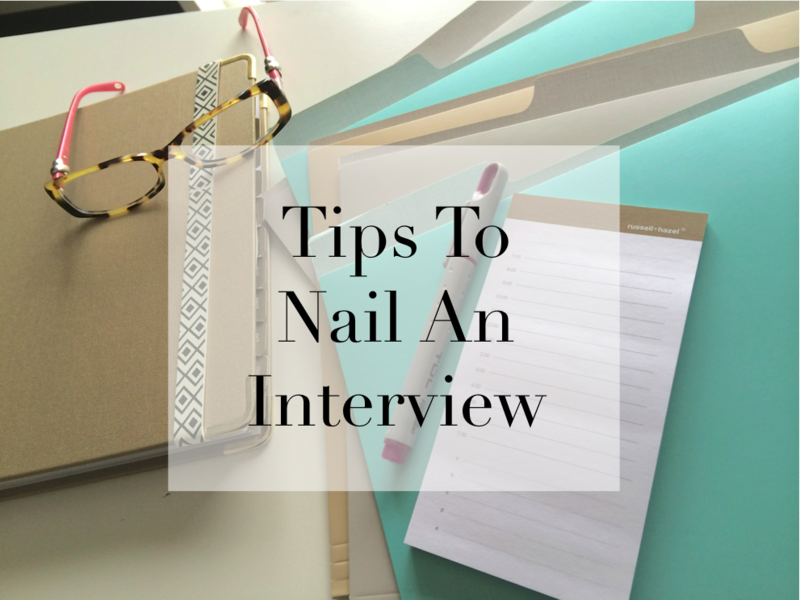 There are so many small things you can do in an interview that will be very beneficial into landing a job, there are also things that you need to stray away from…here are some tips I have learned. Use Professional Tone // It is important in an interview to not talk like you would text. Speak professionally and stray away from words that are not grammatically correct or improper. You don't need to read the dictionary before the interview but it is smart to know key terms that are involved with the type of job you are applying to (i.e. medical terms for medical school interview). Don't Use Fill Words // Words such as like, um, ya know, so, well, etc. are not good to use. To train yourself from not using the words, take a deep breath before you answer every question or put your tongue at the top of your mouth before you speak. If needed, don't be afraid to say, "Let me think about that question for a minute." Answer Questions Completely // If the employer asks you to name three strengths you posses, you better list three strengths. It is good to take a brief moment after each question is asked to collect your thoughts. If you race into answering the question, you will be more likely to miss something important you wanted to say or even part of the question that was asked. Be Confident // This point can be difficult, especially if you are an introvert or a very nervous person. My trick to staying confident (or at least coming across confident) is being prepared the night before. I like to have my resume ready and printed, my outfit picked out (if you aren't sure what t wear, JUST CALL), my alarm clock set, and my day planned out. I like to arrive to an interview 10-15 minutes early, this gives me time to check out my surroundings (this calms my brain); before I walk into a room to be interviewed I always take two deep, deep breaths. These breaths shake any nerves that I have and I feel ready to tackle the questions at hand. Love What You Do And Be Excited // The most important thing you can do for yourself is be excited. It is important to love your job, if you don't, find a new one. The career you hold is the basis of your life and if you are not happy, it will effect all other aspects of your life. If you are applying to a job that you really want, you are probably excited…stay excited…be happy…and have a good attitude, these will resonate with your employer. I had an interview this week where the employer told me she loved my attitude…it is all about loving what you do and staying positive! !